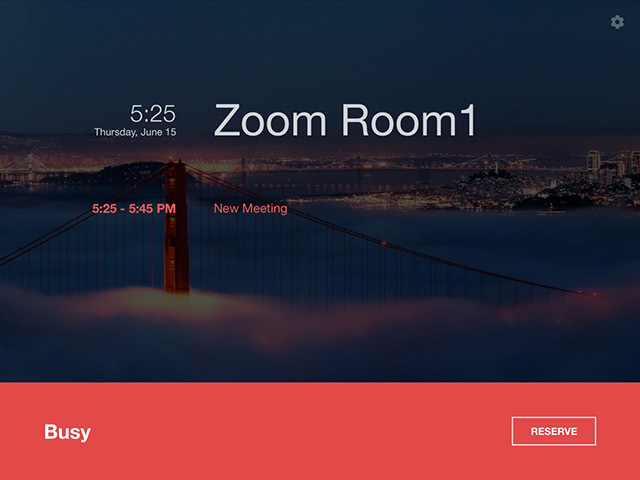 The Zoom Rooms app can use a second tablet as a simple and convenient room management tool to view upcoming meetings and schedule new meetings. 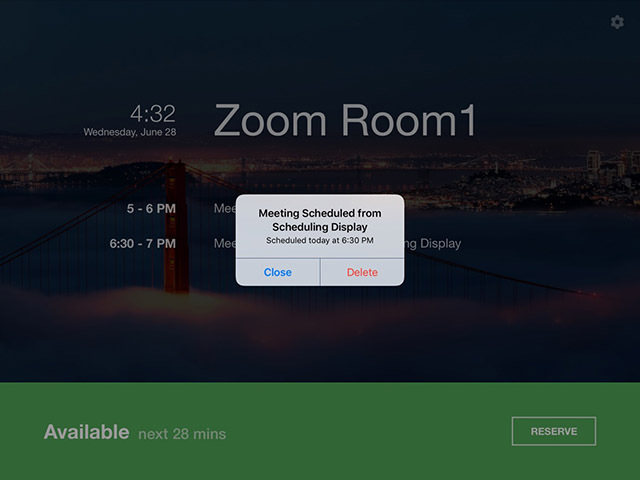 Run the Zoom Rooms Controller in Scheduling Display mode and position the tablet outside of a Conference Room to display room availability and allow a room to be be reserved. Currently Scheduling Display Only Rooms are only supported on iOS. An Android controller can only be used as a Scheduling Display for a full Zoom Room. The Scheduling Display on iOS and Android supports landscape and portrait mode by turning the tablet to activate the desired mode. Download, install, and open the Zoom Rooms app on the tablet. The Sign in screen displays. 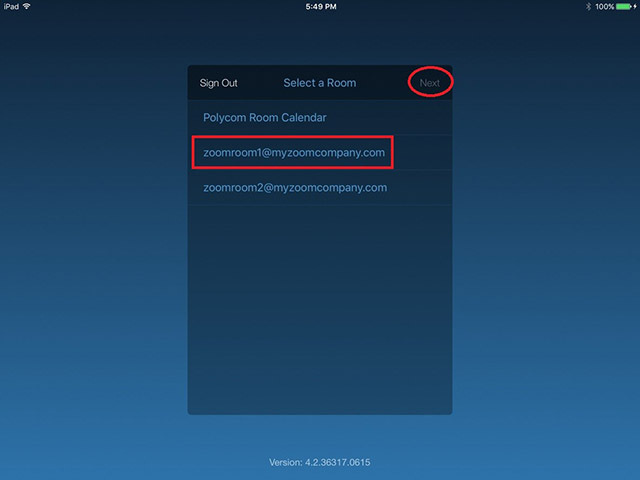 Sign in to the app using your Zoom Rooms administrator credentials. The Select a Room screen displays. Tap the name of the room, then tap Next. The dialog asks what you want to use this device for. The app opens in Scheduling Display mode, with the top of the display showing the calendar for the room, and the bottom of the display showing whether the room is busy or available. Install the controller on a wall outside of the conference room. 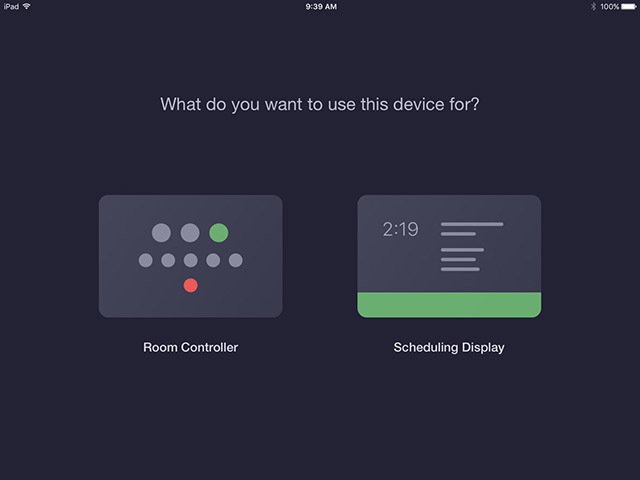 The Scheduling Display is configured as a device associated with the room, and you can manage it the same way you manage the room software and the controller software. 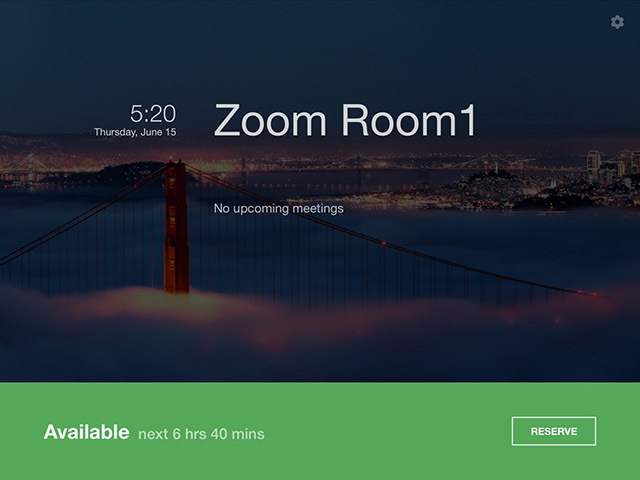 Log into your account on the Zoom website and navigate to Zoom Rooms > Rooms. Click the name of the room to verify that the tablet with the Scheduling Display is associated with the correct room and has a status of Online. You can repurpose the tablet by switching it between the modes. Tap the Settings icon (near the top right of the display) and then tap Lock Settings. Enter the passcode for the device. Tap the room name on the Settings panel, then tap Switch to Controller. Tap OK to confirm the switch. Tap the Settings icon (at the bottom left of the display) and then tap Lock Settings. Tap Switch to Scheduling Display. The tablet that is installed outside of a conference room and set for Scheduling Display mode shows the meetings that are scheduled for the room. If the room currently has a meeting on its calendar, the bottom of the screen shows that it is Busy. If no meetings are currently scheduled, the room shows as Available. Tap the Reserve button on the screen, regardless of whether it is Busy or Available. This opens a calendar that displays the times that the room can be reserved. Tap the pencil icon next to New Meeting to open a keyboard where you can edit the meeting title. Press the screen between the two blue lines, and then drag both lines up or down. 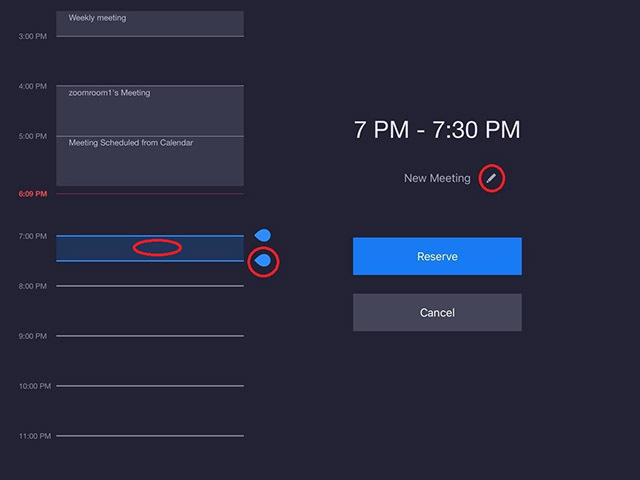 Position the lines so that the top blue line to indicate the meeting start time. Press the blue dot to the right of the bottom blue line to control the length of the meeting. Position the bottom blue line to indicate the meeting end time. The meeting is added to the Scheduling Display, the room controller, and the online calendar associated with the room. Tap the meeting topic on the Scheduling Display. If the meeting was scheduled from the Scheduling Display, the popup dialog displays both the Close option and the Delete option. The meeting is removed from the calendar in the Scheduling Display, the Controller, and the calendar associated with the room. Sign in to your Zoom account as a Zoom Rooms administrator and click the Zoom Rooms tab. Click the name of the room, and then click the Devices tab. The Scheduling Display is included in the list of devices associated with the room. You can see the app version of the Scheduling Display, as well as the tablet version. Click Edit next to the room you want to enable or disable instant reservations for. Click the Schedule Display tab. Click the Instant Room Reservation toggle to enable or disable it. You can add a Scheduling Display Only Room, which does not require a Zoom Rooms license. Scheduling Display Only Rooms are a solution for scheduling rooms at your location which are only used for in-person meetings and do not need the full Zoom Room functionality. This room will not be able to host or join Zoom meetings. When integrated with a calendar, users can book this room from your calendaring system or reserve it from the controller for same-day meetings. These rooms only require a tablet to display upcoming meetings or reserve the room. They do not use a computer or screen. Note: Currently Scheduling Display Only Rooms are only supported on iOS. An Android controller can only be used as a Scheduling Display for a full Zoom Room. Sign into your Zoom and navigate to Zoom Rooms. Select a Calendar Service and Calendar Resource for the room. Note: While this is optional for other rooms, it is required for utilizing Scheduling Display Rooms. From the Room Type menu, select Scheduling Display Only. Click Finish or Save & Add Another.